January 9, 2016, Oakland, Calif. – The Pacific Institute and the Environmental Justice Coalition for Water have released the first analysis of the impacts of the California drought on vulnerable communities and put forward recommendations to alleviate those impacts. 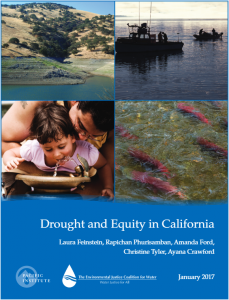 The groundbreaking study, Drought and Equity in California, focuses on three impacts of the drought: domestic water supply shortages, rising water costs, and declines in the salmon fishery. It finds that low-income families, people of color, communities burdened with environmental pollution, and those dependent on salmon for their livelihood and traditions suffered the most severe impacts. The report offers a range of solutions to improve our ability to cope with drought and minimize its consequences in the future, from changing how drought water surcharges are levied to providing assistance to fishing communities and establishing a statewide quantitative metric for water system supply reliability. Disadvantaged communities (those with a medium household income of less than 80 percent of the state median) and cumulatively burdened communities (those that rank in the top quarter of census tracts in the state for environmental burdens and socio-economic vulnerability) were highly affected by water shortages. Drought-impacted public water systems were widespread, with at least one found in 39 of the state’s 58 counties, but were concentrated in the San Joaquin Valley, the North Coast, and the Central Coast. Of the 92 drought-impacted water systems examined, two-thirds served a disadvantaged community, and nearly one-third served a cumulatively-burdened community. Dry household wells were also a major problem for vulnerable communities. In Tulare County, for example, two-thirds of the approximately 1,600 reported dry wells were in a disadvantaged community, and nearly 90% were in a cumulatively burdened community. 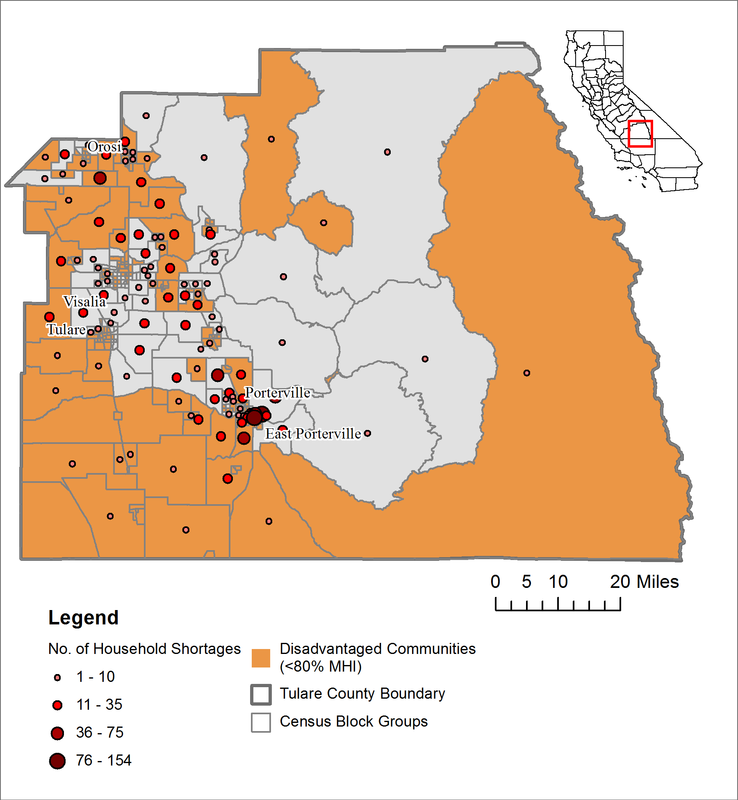 View a map of household water shortages in Tulare county here. The report also found drought charges exacerbated affordability concerns for low-income households. Many utilities use a model for drought charges that raises costs for low-income, low-water users that already pay more than they can afford for their basic water needs. The effect of these charges was most extreme for families earning less than $10,000, raising costs from 4.4% to 5.3% of household income. These households have little or no disposable income, and any increase in water costs poses a major challenge. The drought has exacerbated long-term declines in salmon populations in the Sacramento and Klamath Rivers. For centuries, Native Americans in California and the Pacific Northwest have relied on salmon not only as a source of sustenance, but also as an integral part of their spiritual and cultural traditions. The dwindling salmon population represents a loss of both physical and spiritual sustenance. For commercial fishermen, the drought has worsened conditions for the salmon fishing fleet, which has declined by 80% since 1982. Addressing the underlying inequities in how the state’s water resources are managed is all the more urgent because droughts are becoming longer, more frequent, and more severe due to climate change. Creating mechanisms for meaningful and timely tribal engagement with local, regional, state, and federal agencies.